I like to promote healthy eating on my site and sometimes I feel like a complete hypocrite because I really do not make the best choices when it comes to food. I find that convenience will always win out in the end. Of course I do practice a vegan lifestyle 95% of the time. I really have no problems with animal products if the source meets a certain criterion. So milk from hormone and antibiotic fed cows is completely out of the question. Cruelty is really the motivating factor in avoiding these products in the first place, however, after learning the truth about the quality of these products I honestly would not want to feed them to my family. I realize that I am not alone on this issue. Parents are equally concerned as to the quality of food they are feeding their children. Because we all have busy lives its not always possible to feed our family a healthy diet, especially when we are away from home. Kelly Lester; the designer of Easy Lunch Boxes, is a parent who desired to send her kids off to school with healthy lunches. Kelly also desired a waste free lunch box. 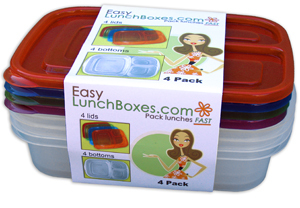 Among its many accolades Easy Lunch Boxes was Named a "top 5 Eco-Friendly Mommy Must Have" by Parents Ask. Please note Easy Lunch Boxes are FDA approved and are free BPA, phthalates, lead, vinyl, or PVC. Also safe for dishwashers, freezers, and microwaves. These kids lunch boxes are not just for kids. We all can certainly benefit from having healthy food choices on hand when away from home. Instead of reaching for those greasy, saturated fat endowed fries we can now have a healthy alternative at our convenience.﻿ Because this is completely safe for the microwave it's perfect for heating up leftovers at work. 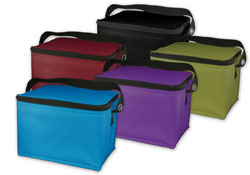 Easy Lunch Boxes stack easily for unobtrusive storage and come in four different colors. You can purchase a set of four on their website for $13.95. 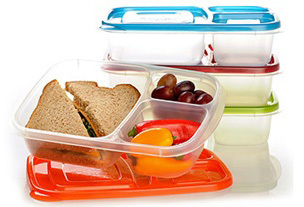 The lunch boxes fit inside the storage totes that retail for $7.95, totaling $21.90. I think this is an incredible value!